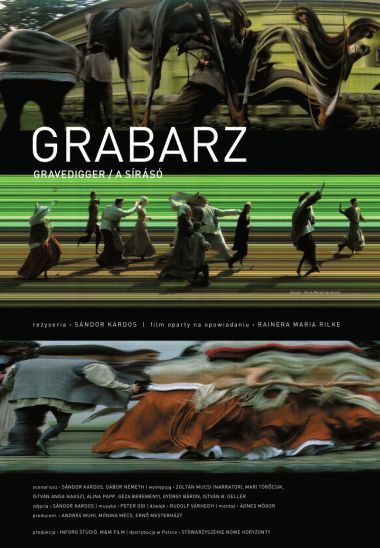 19th New Horizons International Film Festival - "Gravedigger"
A stranger comes to town in this adaptation Rainer Maria Rilke short story, and gets a job as a gravedigger – and the adoration of the local bigwig’s daughter. She spends entire days with him in the cemetery garden, talking about death and dying. A plague befalls the town, sparing only a few, leaving them the task of pushing coffin-laden wagons to the cemetery. The film uses the same camera that records horse racing photo finishes; it does not provide the feeling of space like an ordinary film or photographic camera. Gravedigger lacks the illusion of movement typical of most films. Photographed images track from left to right across the screen. Deformed and fuzzy, as if shot by a trembling hand, the images look like blurred film frames, moving too slowly to create the impression of movement, sometimes forming surreal or abstract compositions. The director takes the audience to pre-Lumière cinema to experience motion picture construction (panoramas) and narration. Born in 1944 in Budapest, Sándor Kardos studied Hungarian philology, linguistics, and culture management at the Eötvös Loránd University, and graduated from the Cinematography Department at the Hungarian Theatre and Film College. Since 1979, he has been working as DP and author of numerous TV shows for MAFILM. He has cooperated with directors such as András Jeles or Péter Tímár. Kardos also established and is general curator of the Horus Archive – collection of photography documenting the everyday life of Hungary. His Résfilm (2005) was pronounced the Best Short Film at the 36th Hungarian Film Week. He often adapts classic literature in his work (Rilke, Kafka). He rejects cinema based on technical simulation of reality and movement as constraining the viewer’s imagination, with the belief that a motion picture should be an invitation to the viewer to perform creative work.